"Portland Company's Locomotive & Marine Engine Works "
A black and white photograph of buildings and equipment near rail lines. 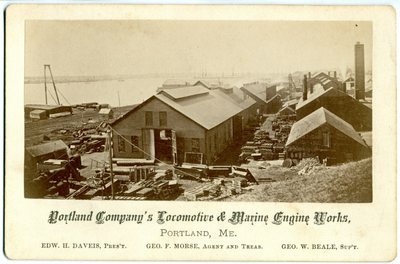 Within a series of cards printed with the text: Portland Company's Locomotive & Marine Engine Works, Portland, Me., Edw. H. Daveis, Pres't., Geo. F. Morse, Agent and Treas., Geo. W. Beale, Sup't.